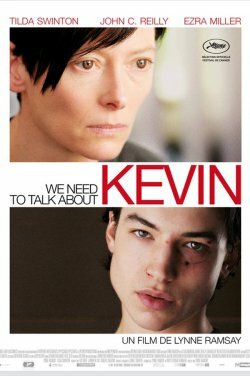 I haven’t read Lionel Shriver’s hugely popular novel, but after seeing We Need To Talk About Kevin, Lynne Ramsay’s adaptation (with co-screenwriter Rory Kinnear), I think I’d like to. I know that the book is told as a series of letters, but the film eschews this approach – there is no voiceover, no letter-writing or reading. Indeed, given the complexity of the film’s structure, I have a feeling that the novel was a challenge to adapt, and that, essentially, Ramsay had to take a big artistic leap in bringing it to the screen in a cinematic way. She’s fractured the story’s narrative, leaping back and forth from an ongoing sequence in the present to a series of scenes from the past that are, themselves, not revealed in strict chronological order. The result is an extremely dream-like film with a nightmarish subject, and with, as far as I can determine, no clear genre model, which is another reason I’m very curious to read the book. The film could not really be called a horror movie, and I’m wary of calling it a psychological thriller. Perhaps it is simply an extremely intense family drama. In the present we find Eva, whose modest suburban house and run-down car have both been savagely vandalized overnight in lashings of blood-red paint. Eva’s off to a job interview. She is a haunted woman – especially as played by Tilda Swinton. Swinton is so perfect in this part that it’s truly one of those cases whereby, at the end, you feel that no-one else could have played the role – and yet on paper it doesn’t seem like a “Tilda Swinton” part: an American, a mother… an American suburban mother? But things aren’t as neat and tidy as that, and as the film plays out, and the character of Eva reveals itself more fully, you grow to grasp why Ramsay was so intuitively brilliant to cast her in the role. Parts of it are suited to the Swinton some of us assume as appropriate to her style; they’re just not the elements you immediately perceive. This present is interspersed with the story of Eva and her husband Franklin (played effortlessly and big-heartedly by John C. Reilly) bringing up their two children, Kevin and Celia. But it’s really about the relationship between Eva and Kevin, which is seemingly cursed from the moment of birth, if not before. It is a relationship beyond toxic. Eva does not seem to possess many of the qualities a parent must have; she is very far from a “natural” mother and has to work extremely hard to engage with Kevin in any joyful way. That said, perhaps no mother could: Kevin, from his earliest earthly moments, seems to completely reject Eva, and it appears to be his life’s mission to make hers a living hell. Kevin is played by two actors – young Jasper Newell and teenage Ezra Miller – who look so alike that you could happily assume that real brothers were cast. They also both look a little evil, and Ramsay directs them and shoots them to play this up: they both have mastered the stare that Nicholson used in The Shining and that Vincent D’Onofrio deployed in the defining moment of Full Metal Jacket: head down, eyes up, mouth open, deadly thoughts assumed. The kids are both good, but they’re good at playing evil, in, I’m afraid, a one-note way, and so the film, for me, doesn’t contain any interior debate: I basically am sure I know who’s at fault here. Again, I’ll be interested to see if the book holds more ambiguity, or more challenges: if it’s as much about bad mothering as about a bad seed. Because in the movie, Kevin is definitely a bad seed. Ramsay (Morvern Callar, Ratcatcher) is a thoughtful, obviously intelligent director and the apparent obviousness of where blame lies in the film is at odds with its otherwise complex elements: it is highly stylized, requires realistic dialogue to carry important moments subtly, and is a little challenging in its narrative structure (but not to the point of being precious). I don’t know if the source material could have ever created a great film adaptation without jumping some genre line-in-the-sand: if the book is essentially a literary novel with horrific elements, the film could have perhaps worked better as a horror movie with arthouse overtones. Instead, it’s defiantly an art movie with horror elements, and thus only as scary as those aspirations allow it to be. All that said, it’s certainly unnerving, Swinton is a knockout, and it’s way more interesting than many, many dead-set “horror” films. Don’t see it if you’re pregnant. Seriously. Is This Man Our Next Clooney?